Salome Gladis Chávez, single mother with four children. Evaristo Ramírez Liñan, single mother with two childen. 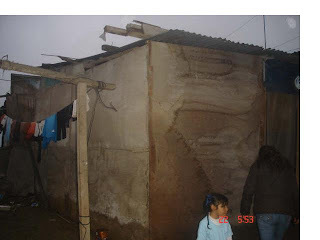 This is Salome's house at the moment, check back in a couple of weeks to see its replacement. Katie was a volunteer at our Villa Maria Project in Peru back in 2000. Tragically, she died in 2007. Members of her team and her family have set up a fund in her name, and some of these funds are going to help the project she supported with Quest. Villa Maria is currently developing a housing project, providing better living conditions for the most needy families in the community, and funds from Katie's campaign have already allowed us to build 10 new houses. This page is to keep you updated on how things are developing.